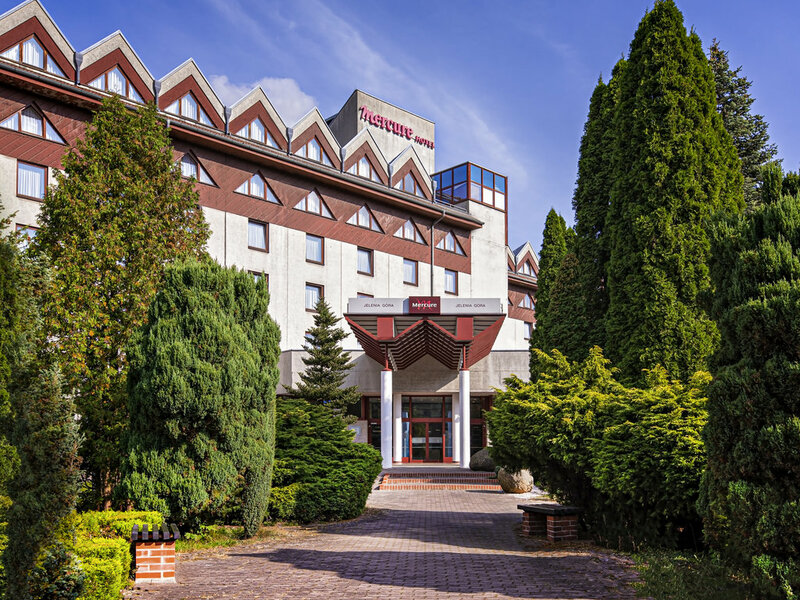 Hotel Mercure Jelenia Góra is situated in the very heart of a picturesque valley, not far from the historic city center and Cieplice Therms. It is a perfect starting point for visiting nearby parks, palaces and mountains. The hotel is also great for famil y gatherings, and business guests will appreciate the ease of access to local companies and offices. We offer 188 rooms and 8 conference rooms, as well as a leisure center, restaurant and parking. An indoor pool and a sauna are at your disposal. Guests can rent bicycles and use the tennis courts located next to the hotel. Choose from a Standard or Superior Room. Comfortable apartment with a balcony. Double bedroom and living room with a sofa. Our air-conditioned restaurant on the ground floor offers Polish and international cuisine and serves breakfasts, lunches and dinners in a cozy setting. We can also organize banquets. The lobby bar serves hot and cold beverages, spirits and cocktails as well as desserts and ice creams. You can also buy cigarettes here. The venue is air-conditioned.